Carpet flooring in businesses and homes are often a key element in bringing the room’s décor and style all together. The perfect color hues, the distinct patterns or even lack of patterns, and even the material used to create the fibers for manufacturing the carpet are important to most home and business owners. Once that perfect carpet is found, it is imperative to have someone who knows what they are doing install the carpet along with any of the various repairs that can occur over the years. 1. Manufacturer’s Carpet Warranty. In the event the carpet comes with a warranty, there are a number of circumstances that will keep your warranty maintained for the duration. One of the requirements is that a professional installs the carpet. Some carpets can be complex to install, especially if there will be a seam present, and requires the expertise and skill of a professional carpet installer. 2. Carpet Installation Efficiency. Avoid paying for excess carpet and products such as padding and tack strips. With a trained professional making the necessary measurements and performing the math, you will not have to waste money on too much carpet, padding and tack strips. The professional will install the carpet to install it with most optimal usage. 3. Aesthetics. The professional that possesses the training, experience and skill can lay your carpet tightly and expertly to ensure seams are not obvious, loose carpeting will not exist, and be able to transition the carpets blending into other flooring surfaces like tile or hardwood floors. A professional installing your new carpet will execute a carpet installation far better than the “handy men” or as a “do it yourself” project. 4. Specialized Carpet Installation & Repair Equipment. 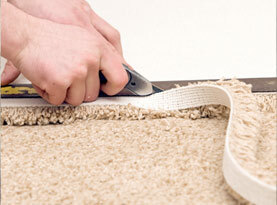 Carpet installation and repair requires specific and specially designed tools for the job. Tools acquired by the lament will not get nearly as top quality as the professionals. These tools are only designed for carpet projects, thus you will have to buy and store tools and equipment you won’t use but once every blue moon. Finally, when purchasing specialized equipment and tools you should expect a hefty bill attached. Professional equipment and tools are often obtained through manufacturers catering to only professionals, where they will get top-grade tools, leaving you without the burden of obtaining or storing the tools. 5. Carpet Service Preparation & Cleanup. 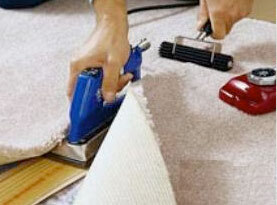 There is a lot more to laying carpet and attaching to the ground. A substantial amount of time is invested to prepping the subfloor and cleanup after the carpet is laid, and professionals include the prep and cleanup work. 6. 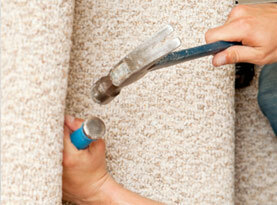 Carpet Installer & Repairman Expertise. When hiring the professional, you not only pay for our time, but also the expertise and experience we brings along. Hiring the professional often sends fear into people with the expense that has many attempting their own DIY projects. But with Jim Ryan Carpet Repair’s affordable rates, you would be crazy not to invest in the professional for your carpet care needs. We do carpet installation, stretching and repairs. We use the best materials and tools. With our professional’s skills and expertise, Jim Ryan Carpet Repair is the best investment you will make for your carpets needs. Call us today!